Note that agriculture is treated as a specific industry. Agriculture is distinct from land use, land use change, and forestry, which is handled on its own LULUCF Sector page. Two types of emissions are tracked in the Industry Sector: energy-related emissions and process emissions. 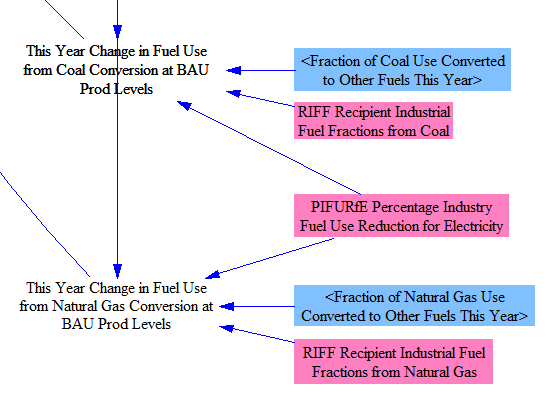 Energy-related emissions are similar to emissions from other sectors in the model; they come from the combustion of fuel to generate energy that is used to provide specific services (in this case, to manufacture industrial products). It does not matter if the fuel is combusted to create usable heat, on-site electricity, or some other form of energy: this is considered fuel use by industry. This means that the electricity use by industry shown in the EPS refers to electricity obtained from the grid, not electricity generated on-site using fuels, waste heat, or other means. Process emissions refer to the emissions of any of the twelve tracked pollutants that occur as a result of industry operations and which were not related to the combustion of fuel for energy. For example, when limestone is chemically broken down as part of the cement-manufacturing process, the CO2 that is released is an example of process emissions. Similarly, when methane leaks from wells or pipes, the leaked methane is process emissions. Sometimes a high-GWP gas is itself an industrial product, such as various HFCs that are used as solvents, fire suppressants, refrigerants, and propellants; these also count as process emissions. The EPS considers policies only on a national scale. Typically, a unilateral policy that lowers emissions from industry will lead to an increase in emissions in other nations. This can happen because some companies move their operations overseas, or because companies that are already overseas scale up production (to export to the modeled country- in this case, to the U.S.) and domestic manufacturers reduce production. In certain cases, leakage can be negative- that is, a reduction in emissions from the modeled country also leads to a reduction of emissions from other countries. This is most likely to happen if the modeled country (the U.S., in this case) is a major player in setting the market price for a globally traded commodity. When policies within the U.S. cause the U.S. to reduce production, the global price for the good increases due to the reduction in supply. As a result of the higher prices, consumers in other countries reduce demand for the product. In the case of the U.S., production of coal, oil, and gas all have negative leakage rates, whereas nearly all other products have positive leakage rates. 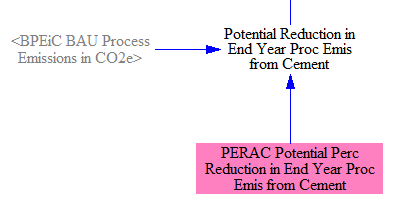 Emissions due to leakage are estimated by the model but are not added to total emissions, since that total is meant to reflect only emissions from the modeled country. 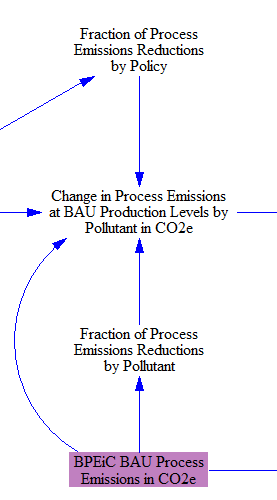 We calculate the fraction of process emissions reductions attributable to each policy for each industry so that we can perform a double-check when calculating the change in process emissions at BAU production levels, to ensure that reductions do not exceed total process emissions (of a given pollutant for a given industry), which can happen if BPEiC and PERAC use different data sources. 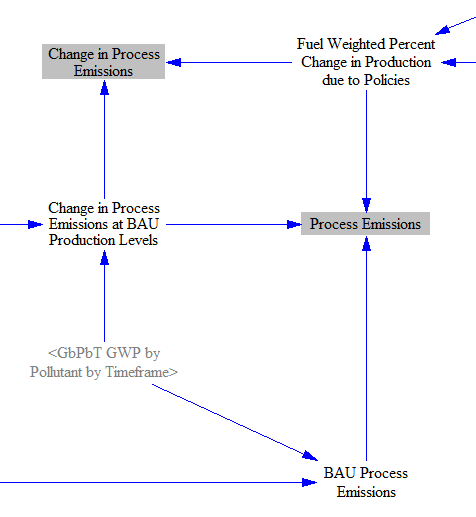 Finally, we apply the fuel-weighted percent change in production due to policies (the calculation of which is explained below) to adjust both the process emissions and the change in process emissions to reflect increases or decreases in industry production levels. 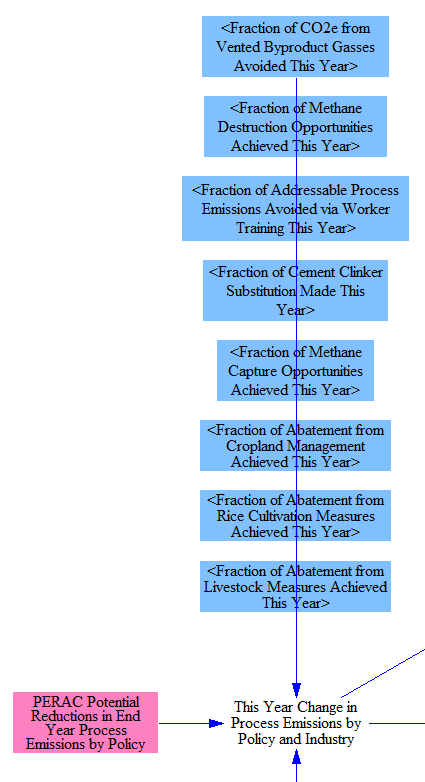 The “Process Emissions” variable is used later on this sheet as a component of total Industry sector emissions, while the “Change in Process Emissions” variable is used on the Industry - Cash Flow sheet. The Industry Sector policies that do not affect process emissions instead affect fuel use, either by reducing fuel use or by changing the type of fuel that is consumed. Some cross-sector policies, such as the carbon tax and fuel taxes, can also play a role. 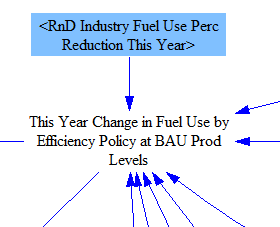 To find the fuel price-driven component of change in industrial production levels, we take the difference in fuel costs (by fuel) between the BAU and policy cases. 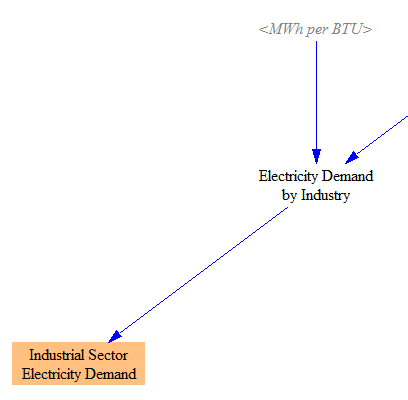 We multiply this by an elasticity of production by industry with respect to fuel costs by fuel to find “Percent Change in Production due to Fuel Cost Changes.” The carbon tax works similarly: we multiply the carbon tax rate by an elasticity of production per unit carbon tax due specifically to non-fuel inputs. (The carbon tax’s effect on fuel prices is already factored into the fuel price-driven adjustment.) We use a source for the effect of a carbon tax on overall production levels by industry and multiply by the fraction of inputs that are not fuel, on a dollar basis. 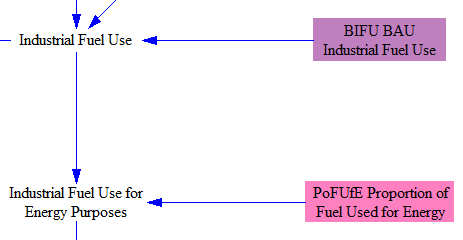 We combine these two effects (change in production due to fuel cost changes and due to nonfuel carbon tax effects) to obtain a final “Percent Change in Production due to Policies.” This percentage change in production affects both fuel use and process emissions. This gives us the total industrial fuel use for energy, including fuels used for CCS. 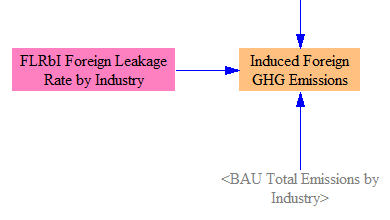 The difference between BAU and policy case emissions by industry are multiplied by the foreign leakage rate (by industry) to obtain the total induced foreign emissions. These emissions are not added into the totals for the modeled country or region- they are simply reported here. More information about the calculation of foreign leakage appears above on this page, under the “General Notes” header.